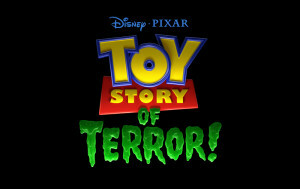 ABC has set an airdate for Disney-Pixar’s first special for television, “Toy Story OF TERROR!”, a spooky new tale featuring all of your favorite characters from the “Toy Story” films, airing Wednesday, October 16th from 8:00-8:30pm ET. The cast of “Toy Story OF TERROR!” includes Tom Hanks as Woody, Tim Allen as Buzz, Joan Cusack as Jessie, Carl Weathers as Combat Carl/Combat Carl Jr., Timothy Dalton as Mr. Pricklepants, Don Rickles as Mr. Potato Head, Wallace Shawn as Rex and Kristen Schaal as Trixie.